MONCTON, N.B. 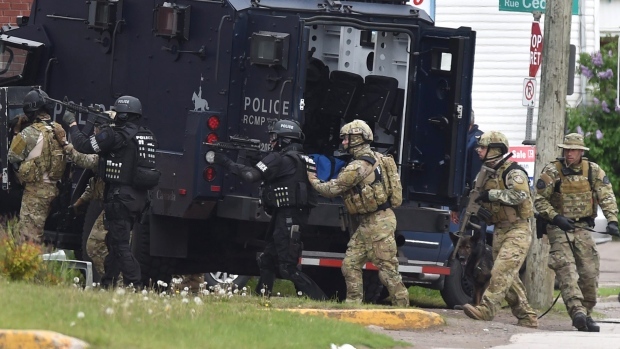 -- The Crown and defence have asked for more time to prepare a case on alleged Canada Labour Code violations by the RCMP related to the force's response to a June 2014 shooting rampage in Moncton, N.B. Defence lawyer Mark Ertel of Ottawa told the court that the defence has given the federal Crown a list of changes to the statement of facts and both sides need time in an effort to narrow the issues in the complex case. "It's a big, serious case," he later told reporters outside the court. It's the latest in a string of delays dating back to July 2015. Ertel told Provincial Court Judge Anne Dugas-Horsman that they hope to reach some agreements because a trial would take months to prosecute and defend. Federal Crown prosecutor Paul Adams agreed and stated that the charges are indictable. Employment and Social Development Canada alleges there were four violations of the code relating to the force's equipment, training and supervision in the June 4, 2014 incident that resulted in the deaths of three Mounties. Justin Bourque shot and killed constables Doug Larche, Fabrice Gevaudan and Dave Ross, while constables Eric Dubois and Darlene Goguen were wounded. He was captured following a 30-hour manhunt. Bourque was sentenced to life in prison with no eligibility for parole after pleading guilty to three counts of first-degree murder and two counts of attempted murder. An RCMP review of the shootings said responding officers faced a litany of problems that included communicating accurate information, accessing high-powered weaponry and securing protective equipment. In May of last year, the Public Prosecution Service of Canada recommended the RCMP be prosecuted for contravention of the occupational health and safety provisions of Part II of the Canada Labour Code. The charges allege the RCMP failed to provide members with appropriate equipment, information, instruction and training in an active shooter event, and failed to provide supervisors with appropriate information and instruction or training in an active shooter event. A final charge alleges the force failed to ensure in general, the health and safety of its members. The defence has elected to have the case tried in provincial court and a pretrial conference is set for April 7. "We'll be discussing issues and seeing if we can narrow issues and keep the case moving," Ertel said. However he wouldn't say if that could result in a reduction of the number of charges. "We're really not at that stage yet. The matter is before the court and we have to let things unfold in court the way they will," he said. Ertel said a plea will be entered on April 7 and a trial date will be set.